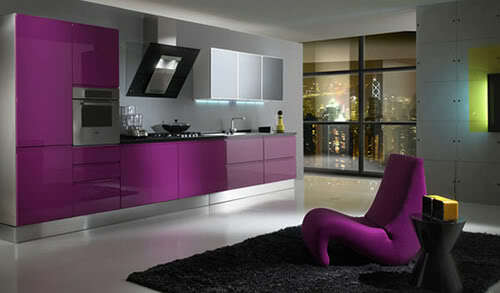 As one of the current color trends, purple is hot news in the world of home decorating right now. The biggest question when decorating with purple, is what other colors it matches well with, to combine to make a beautifully decorated room. Go for a monochromatic look- combine purple with other purple elements of varying shades and color intensities. There are so many different shade of purple from pastel lavender and lilacs, to the deeper berry shades. There are also the more red hues of purple, like eggplant and burgundy that all combine beautifully with purple. Try a complementary scheme - a complementary color scheme is when a color from one side of the color wheel is matched with the opposing color. In this case, the complementary color to purple is yellow. This can be a difficult look to pull off, but two easy ways of making it work are by using softer, paler tones of each color rather than intense purple and yellow; and by using only one of the colors as a main color, as the other as an accent color. For example you might want to pair a purple couch with yellow cushions, or yellow curtains with a purple tie-back. Go uber trendy with the latest hot colors - purple (especially the current trend for deep berry shades), can combine well with other hot colors of the moment. Zesty green, grey, metallics, and mushroom tones, all combine well with purple to make a sophisticated, yet trendy look. Dark wood elements also look great teamed with the color purple. Living Room- there is a lot of scope when using purple to decorate the living room because of the amount of soft furnishings. I would recommend using purple on one or two walls only, and then build up the color scheme using different shades of purple on the curtains, sofa, cushions and rug etc. Try to utilize as much texture in the room as you can. Bedroom - the bedroom is a wonderful room to decorate with purple as it has such a modern, yet romantic appeal. Stick to the more red hues of purple, and team with dark wood, cream, and lots of metallic elements - ornate mirrors, mirrored wardrobe doors, or mirror fronted bedside tables all look great, as well as being on trend. Kitchen - the choice when decorating the kitchen with purple, is to choose either the walls, or the cabinets to be purple, and not both. A good combination for purple in a kitchen would be warm cream or mushroom - whichever you use on the cabinets, use the opposite on the walls. For example the picture shows purple cabinets with cream walls. When using purple in smaller rooms it is important not to overwhelm the room with large expanses of purple, and just keep it to accent items or a small feature wall, even a masked off wall panel would work well. A small bathroom, for example, could feature purple in the form of towels, glass bottles, wall art and DIY Roman Shades. With a larger room, an accent wall with purple is often sufficient, and then larger items can be incorporated into that such as the sofa, rugs, or wall art. 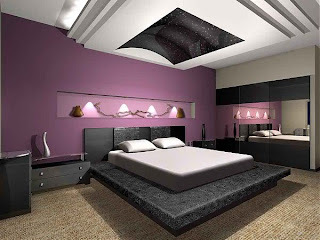 You can use it on other walls as either a strip of color around the room, or else use a slightly different shade of purple for each wall - making sure that you don't use too much in the way of dark purple colors as it can feel quite oppressive. Remember there are many different shades of purple, so take time to choose the best one for you and the room you are decorating - bearing in mind the light that gets into your room.